In collaboration with The Bushwick Starr, Superhero Clubhouse brings environmental education to elementary students through after-school playwriting programs. Kids write plays about local ecology, climate change, and environmental justice, then see their work professionally produced for audiences of their peers and families. Tickets on sale April 2! 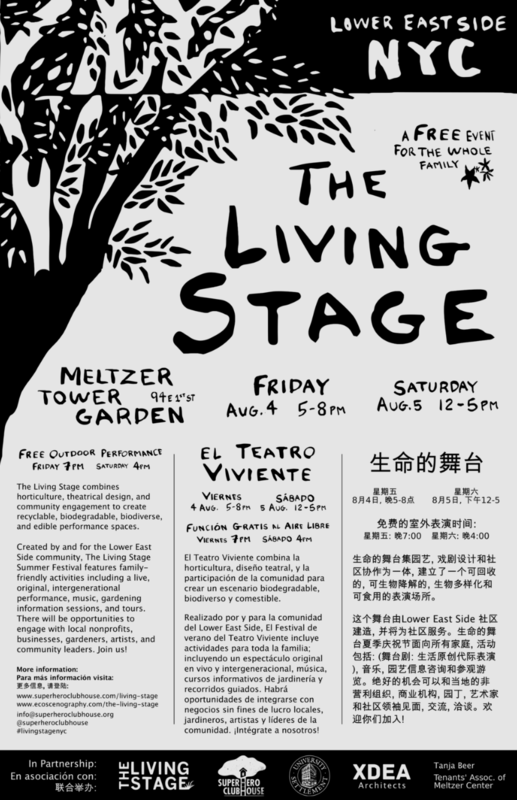 Big Green Theater (BGT) is a program we developed in partnership with The Bushwick Starr that combines environmental education with an annual green theater festival. Fourth-, Fifth-, and Sixth-grade students from Bushwick schools explore environmental topics with guest experts, and then are guided in writing original eco-plays. Finished plays are fully realized and professionally produced at The Bushwick Starr Theater during Earth Week, featuring sustainable and efficient design. Each week, students are introduced to “eco-experts” who give interactive presentations on specific environmental topics. We also go on field trips to laboratories and ecological institutions. Teaching Artists and volunteers guide students in writing rough drafts of plays inspired by the scientific research. Each student selects one of their rough drafts to develop and eventually see performed. Students learn about the rewriting process, engage in design workshops, and write songs to include in their plays. The classroom portion of the program culminates in a reading of students’ final drafts, read by the adult actors who will be performing them. An intensive four-week rehearsal process begins at The Bushwick Starr with a team of professional artists, and the theater is transformed utilizing ecological design practices. At the end of the month, free school and public performances are offered for the student plays, their families, teachers, peers, and community. The program ends with a reflection party, where student playwrights get a chance to respond to the process and performances. THE LIVING STAGE combines horticulture, theatrical design, and community engagement to create recyclable, biodegradable, biodiverse, and edible performance spaces. The NYC version, led by Superhero Clubhouse in partnership with University Settlement and eco-scenographer Tanja Beer, will feature a lush living stage situated amidst the urban landscape of the Lower East Side. Created by local seniors and students, the space is then inhabited by performances made for and by the community.